Ok, stay with me. 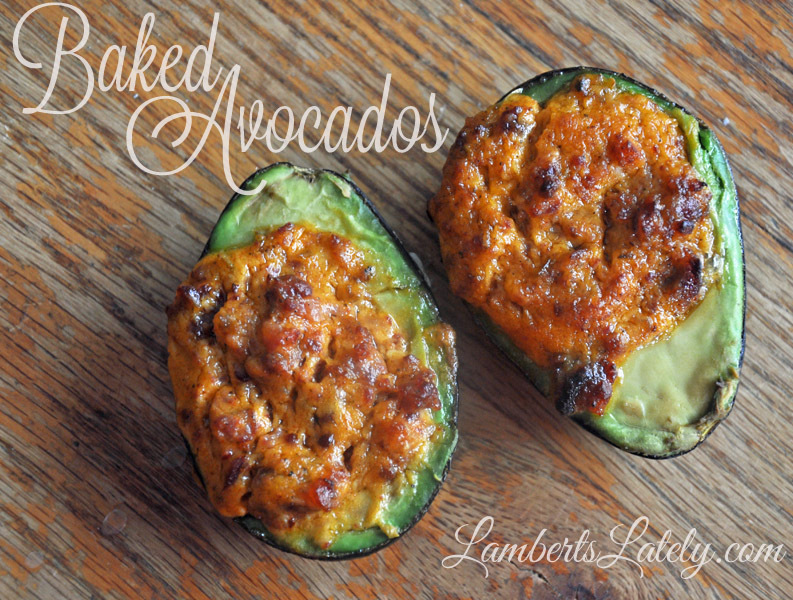 If you’ve never had a baked avocado before, it sounds disgusting. But OH. So good. Baking the avocados makes them just a little bit more tender and a whole lot more flavorful…plus the taste of the avocado plays off the taste of the stuffing mixture so well. We have a local restaurant that makes these as an appetizer. I tried my hand at it, and I promise, they’re just as easy to make at home! Take your halved, pitted avocados and, with a spoon, hollow out a little bit more of the hole for the pit. Take this extra avocado meat and put it in a bowl. Sprinkle the lemon juice over the avocado halves and put them, hole side up, on a cookie sheet. Into the avocado meat, mix in the mayo, chili sauce, and bacon (sausage works great too!). The sauce should be a coral color from the chili sauce. Divide this mixture among the avocado halves. Bake for 12-15 minutes at 425 degrees, until the mayo mixture is crispy on top and the avocado meat is just starting to get soft.You might also like these recipes!